Avignon tramway project consists of a 5.2km-long railway line, connecting Saint Roch to Saint Chamand. Alstom was contracted to supply ten Citadis trams for the Avignon tramway. The Citadis tram offers a maximum speed of 70km/h. The infrastructure work at Saint Chamand began in May 2017. The Community of Greater Avignon (Communauté d’Agglomération du Grand Avignon) began construction on a tramway project in Avignon, a commune in Provence region in south-east France, in October 2016. The tramway is expected to serve up to 25,000 passengers a day in the initial stage of operation. The first section of the Avignon tramway project will consist of a 5.2km-long double-track tram line between Saint Roch and Saint Chamand. The new tramway is intended to cater to transport needs for the growing population in the city. It is expected to provide improved public transport in Avignon City Centre, as well as residential, commercial and business areas. The City of Avignon originally planned to build a 14.7km tram network consisting of two tram lines at a total cost of €250m ($330m) in 2013. In January 2015, the Greater Avignon Council announced a revised plan to build one tram line instead of the two originally planned, as well as two bus lines at an estimated cost of €135m ($150m). The first section of the Avignon tramway network will be developed in four phases. The roadworks, including diversion and renovation of underground networks, commenced in October 2016 and concluded in April 2017. Infrastructure and line works began in May 2017 and are expected to last for ten weeks. The trams are scheduled to be delivered from October 2018, and tests will be held between January and June 2019. The first section of the tramway will be opened for public in June 2019. 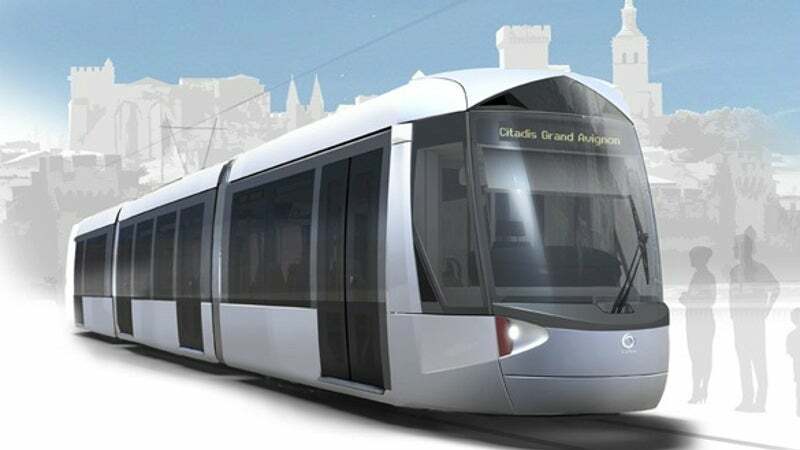 The Avignon tramway project will involve the creation of a 5.2km-long tram line, ten stations, two high-frequency bus lines, and a redeveloped bus network. The tram line will run from Saint Roch to Saint Chamand, via Avignon Central railway station, Les Roses, Place St Ruf, Marius Jouveau, Stadium, Librairie, Aquilon, and Barbiere. It will be coupled with two high-frequency bus lines, exchange hubs and a new bus network to provide direct access from the tram platform to a wide range of transport options, such as trains, cars, buses and bicycles. The bus lines will run between Hôpital and Le Pontet-Avignon Nord through Avignon Central railway station, and between Agroparc and Saint Lazare via Pierre-Sémard street. A maintenance centre will be built in St Chamand for operating and maintaining the tramway. Alstom was contracted to supply ten Citadis Compact modular train sets for the Grand Avignon tramway project. The trams will be designed and assembled at multiple industrial sites in France. Each train is 24m long, 2.4m wide, and 3.6m high with a pantograph. It can accommodate up to 150 passengers and run at a maximum speed of 70km/h. The tram has four 1.3m-wide double-access doors to speed-up passenger boarding and minimise downtime at stations. Featuring large windows and air-conditioning, the Citadis Compact trams facilitate comfortable and safe travel for the passengers. The interior design will feature large individual seats, a 40% glass area, and LED lighting. Built using recyclable materials, the trains emit a reduced amount of carbon dioxide and noise. The trains will be operated at a frequency of five minutes during peak times, allowing them to serve as an alternative to cars. SAFEGE was appointed to provide impact assessment, design and consultation services for the tram project during 2011 and 2016. In May 2017, the Greater Avignon Agglomeration (Communauté d’Agglomération du Grand Avignon) and SPL Tecelys awarded a contract to a consortium led by TSO, a subsidiary of French public works group NGE, for the civil works of the platform and track. The consortium partners, which also include Alstom, Guintoli, EHTP and Agilis, will be responsible for civil works across 10.8km of track with eight corresponding track turnouts, ten stations, and a maintenance centre as part of the contract.